If an open casket will be displayed for viewing during any part of a loved one's funeral, you may be faced with a big decision: to view, or not to view? Knowing that it's a decision you must make quickly, how do you decide whether or not to view your loved one's body a final time before burial? Putting a body on display is a time-honored funeral tradition, yet this style of mourning can be disturbing to some people. At the end of the day, whether or not you view your loved one a final time is a personal decision. It should go without saying that no one should feel pressured to attend an open casket viewing, because everyone's way of grieving is different. However, many people often face an internal battle, wondering if they will regret their choice. This article will explore the most important things you should consider when making this emotional decision. What is an open casket viewing? An open casket viewing is a funeral event that allows mourners to visit the body of their deceased loved one a final time, and say goodbye. There are religious reasons for choosing an open casket, as well as personal ones. For many, a final chance to see a loved one is an important part of getting closure and accepting the loss. The decision to view or not view a loved one's body is a personal choice that you only get to make once. Unfortunately, it's a choice that you have to make quickly. While many people consider it normal and proper to view the body of a loved one at a funeral, others may consider this in poor taste or frightening. It's normal to feel unsure. People who have never seen a body before are typically nervous about deciding to view a loved one's body, and understandably so. Fear of seeing something unfamiliar or gruesome may be paralyzing to one who is freshly grieving. Even if you are accustomed to open casket funerals, your relationship to the deceased person might influence your decision. What will the body look like? There's no getting around it: Dead people look dead. Despite modern embalming techniques being so advanced that a dead person can be restored to look nearly alive, they are still going to look a little different than they did in life. That said, you probably shouldn't fret about seeing anything too frightening at an open casket viewing. Seeing death is just one way people can begin to accept a loss. Open casket viewings aren't always possible, depending on the manner of death and level of decomposition that has occurred. It is unlikely that a qualified funeral director would permit a body to be viewed without first ensuring they could produce a lifelike aesthetic. 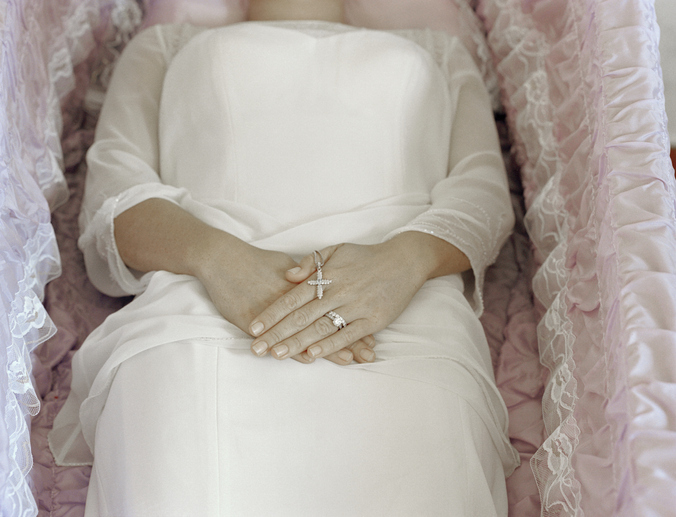 Before allowing a body to be viewed by relatives, the attending mortician will restore the deceased person to a lifelike condition using embalming, makeup and other techniques. If the manner of death was physically damaging to the body and the family insists on an open casket, take these factors into consideration when making your decision to view. Rest assured, however, that morticians are able to smooth over most damage, leaving a dead person looking almost as well as they did in life. Do I want to remember my loved one this way? Many mourners worry that the vision of their dead loved one will haunt them forever. To some extent, it's true that the memory of a beloved friend or relative in a casket is one that will stay with you forever. However, most people do not find that all their memories of their loved one are clouded or 'ruined' by viewing them in their casket. Like all memories, this moment will form part of your experience with the person who passed. In fact, it will be your final image of them, and the end of your story together in terms of physical presence. Many people find this moment to be precious and irreplaceable. You know yourself best. If you think you'll be haunted by this image, you should feel no pressure to attend a viewing. Will I regret this decision? It's hard to anticipate how you will feel in the future, particularly during a time of great stress. It's easy to feel pressure to make the right decision, since this will be your only chance to view your loved one a final time. And in grief it's easy to feel like every decision is the most important one you will make. It may feel like opportunities with your loved one passed you by too quickly. Don't put more pressure on yourself at this time. An open casket viewing can be an important moment for closure, but your grief will run its course regardless of what you decide to do. Go with your gut, and let go of your doubt. Though deciding whether or not to view your loved one in an open casket ceremony is a decision you should put thought into, your choice will be the right one regardless of what you do. Over the coming months and years, your relationship with the deceased person will continue to change as you move through your grief. Take care of yourself and those you love, get through the funeral and do what's best for you in the here and now.